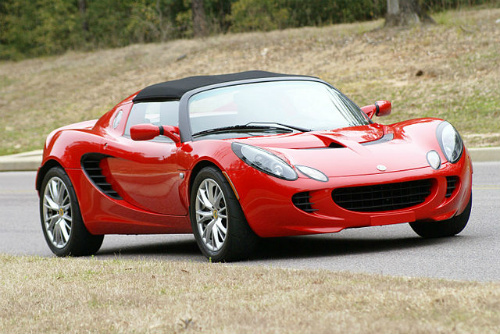 The Lotus Elise Series 1 sports car could not be produced, in its present format, beyond 2000 due to new European Directives concerning the ability of cars to withstand impact. Accordingly, in order to fund the necessary development work, Lotus had to establish a new business partnership. The outcome was that General Motors agreed to support Lotus, with the proviso that Lotus was to build forthcoming European Opel And Vauxhall sports cars, using GM power plants and badges. These GM-branded cars were built on the same production lines as the existing Lotus models until they were discontinued in late 2005. In October 2000, the Lotus Elise Series 2 sports car was launched, and consisted of a redesigned Series 1 unit incorporating a modified chassis in order to accommodate the new regulations. It had a restyled interior and hood, lowered sills for easier access, uprated suspension, and an improved braking system. In 2004, Lotus began the process of replacing the Rover K-Series engine with the Toyota 2ZZ-GE, 1.8 litre, 4-cylinder, 16 valve, double overhead cam engine, with Variable Valve Timing. A less highly tuned version was also available, in the form of the Toyota 1ZZ. The smooth lines of the Elise Series 1 gave way to a more angular form of body styling in the Series 2 variant, which was available as Sports Tourer or Race Tech versions. The Sports Tourer featured leather seats, fitted carpets, an audio system, and extra cabin storage. The Race version had leather seats with carbon trim, drilled disc brakes, redesigned suspension, stiffer springs, and new dampers. However, the standard Rover K-Series engine was retained from the Series 1, whilst a new Lotus engine management unit was added. Fitted with a close ratio gearbox, it developed 120 bhp, and produced a top speed of 125 mph, with a 0-60 mph time of 5.6 secs, and a 0-100 mph time of 17.5 secs. In February 2002, air conditioning was offered as an optional extra and, a month later, the Cobra immobiliser system was now standard equipment. Also in March 2002, a new hard top was introduced. Based on the Series 1 Elise 111 model, the Series 2 variant was introduced in June 2002. It was powered by the 1.8 litre, Rover K-Series Variable Valve Control (VVC) engine, fitted with a Lotus K4 engine management system, which developed 156 bhp at 7000 rpm, and 129 ft/lbs of torque at 4650 rpm. This produced a 0-60 mph time of 5.1 secs. It used 16 inch front wheels, and 17 inch rear wheels. That same year, the Series 2 Lotus Elise 111S sports car was introduced, powered by the same 1.8 litre, Rover K-Series VVC engine. It was offered with either Sports Touring or Race Tech specification, and both featured drilled disc brakes, different wheels, and metallic a paint. The Sports Touring variant included leather seats and trim, and fitted carpets. This variant was not fitted with the long roof, and was discontinued in 2005. The Series 2 Lotus Elise 111R, designed with an eye for the track, was powered by the Toyota 1.8 litre, 2ZZ engine. Fitted with a six speed gearbox, it developed 189 bhp, with a 0-60 mph time of 4.9 secs. It used a new rear subframe, revised rear suspension, and servo assisted ABS brakes that were track tuned. In January 2002, and in the UK only, the standard Elise Series 2 received the Sport 135 engine upgrade, which included an aluminium inlet system, stainless steel sports silencer, and a reprogrammed engine mangement system to improve power output. It was now referred to as the Series 2 Lotus Elise Sport 135. This upgrade resulted in 135 bhp at 6200 rpm, and 129 ft/lbs of torque at 4850 rpm, a top speed of 129 mph, with a 0-60 mph time of 5.4 secs, and a 0-100 mph time of 14.9 secs. In March 2002, this upgrade was offered to all Series 2 Elise owners, and included an alternative gas flowed cylinder head, but not a sports exhaust. The Lotus Elise 135R sports car variant was a track orientated model with sports suspension and wider wheels, and fitted with the same 135 bhp engine. In some markets, the Elise 135R was substituted for the Sport 111, which was similar, apart from the fact that the 135 bhp Rover K-Series engine was replaced by a VVC unit, developing 156 bhp. It was powered by the 1.8 litre, Rover K-Series, VVC engine, which developed 156 bhp. A 2002 Lotus Elise Series 2 in good condition would fetch around £12,000/$19,000, whilst a 2002 Elise 111S would command about £13,000/$21,000, and an Elise Sport 135R would come in at around £24,000/$38,000.